In addition to operating Studio Chi and teaching, Brenda Molloy has a very successful practice. Brenda’s wealth of knowledge has transformed the health and lives of many satisfied clients. 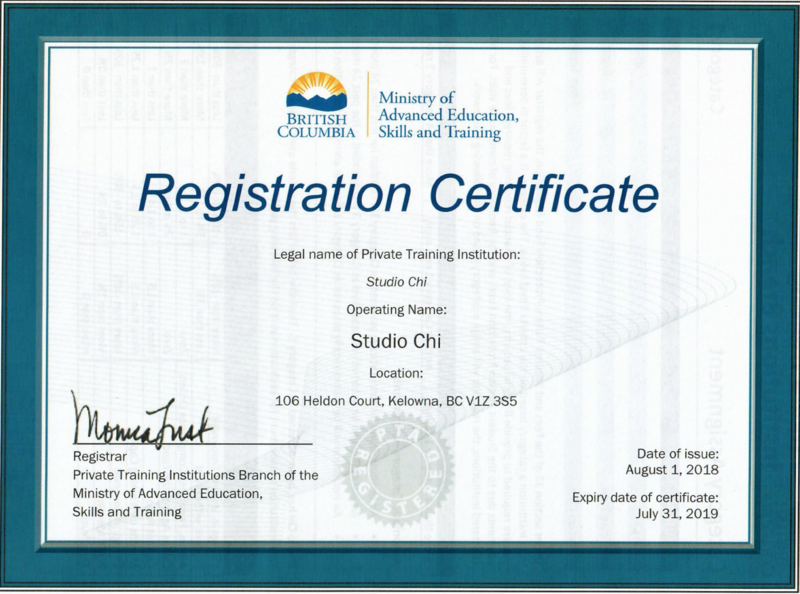 Brenda Molloy is a Registered Shiatsu Therapist, Registered with the Shiatsu Therapy Association of BC. Shiatsu is traditional Japanese massage therapy. It is used to improve the flow of vital life energy (Chi) in the body. Shiatsu helps prevent illness, build vitality, balance the mind, and stimulate the body’s natural healing ability. Brenda uses this elegant healing system by combining hand pressure, gentle muscle manipulation and stretching to alleviate headaches, tension, pain, and a wide range of chronic discomforts and minor ailments. No needles are ever used. Shiatsu is traditionally practised on a mat on the floor, however table shiatsu sessions are available. Pregnancy shiatsu is given with the Mom lying on her side and/or back. This relaxing and therapeutic shiatsu session releases muscular tensions, regulates digestion, and calms the mind. The harmonious flow of chi (energy) between Mom & baby is encouraged and supported. Brenda incorporates the use of Acutonics tuning forks, pure crystal singing bowls, and Tibetan healing bowls to achieve balance in every cell. The vibration of sound moves throughout the body releasing toxins and tensions from the body, mind and soul. Tuning Fork Therapy is an energy-based non-invasive treatment that is similar to acupuncture. Precision calibrated tuning forks are applied to specific acupuncture points to access the body’s Meridian and Chakra energy systems. The sound waves of the forks vibrate and travel deep into the body along energy pathways (meridian system), affecting human physiology and reaching deep into the cellular memory. Applying the forks stimulates and balances the body’s physical being promoting healing and inner harmony. Listening to the forks is relaxing and soothing, allowing them to access our sense of motion, balance, memory, healing and connection with all that is. The Sound Healing Facial is a natural, painless, non-surgical method that reduces the signs of aging creating a radiant appearance. Tension is gently released from the face, head & neck using tuning forks and jade rollers relaxing the entire body ~ achieving inner and outer beauty. Acupressure points are stimulated using gentle but firm pressure to release muscular tension, promote the circulation of blood, and stimulate the body’s natural self-curative abilities. This elegant healing art is performed with the client relaxing on a massage table. From day-to-day pressures to life’s most significant trials, traumatic events can cause the body to shut down and keep negative feelings “stuck”, resulting in physical ailments and emotional imbalances. Using gentle touch vital points are targeted to encourage the body, mind and soul to release what it no longer requires. Acupressure points, Shiatsu, and an awareness of the meridians (energy pathways) are combined in a relaxing, balancing & energizing oil massage. This massage can gently sweep across the surface of the skin or delve deep into the muscles and tissues. The depth of the massage and intensity of pressure is entirely up to the individual. Reiki (pronounced Ray-key) is a Japanese name consisting of 2 words: ‘Rei’ and ‘Ki’ meaning spiritually guided life energy, an energy which animates us all and is found all around us. Reiki is a form of spiritual healing whereby this “Universal Life Energy” is channeled through the practitioner to the recipient. Reiki helps to harmonize the body, mind and spirit. Clients relax, fully clothed, on a massage table. A session can last an hour or longer depending on the treatment required. There is no pressure on the body making it ideal for treating all ages and conditions, and sometimes hands are held away from the body. The energy flows to where it is required (spiritually guided) and can normally be felt as a warm sensation or tingling in the body. Receiving Reiki is a very relaxing and soothing experience! Alleviates many physical conditions including back, joint & headache pain. Brenda Molloy is a charismatic and thought provoking speaker who inspires others with her enthusiasm and passion for life. She is a seasoned presenter who has awakened audiences at conventions, retreats, places of worship, and private venues. Brenda recently presented a self empowerment workshop at my company conference. I was instantly impressed with her ability to create an environment of openness, inclusion and awareness with our group. Brenda’s nurturing, inspiring and supportive style of teaching allowed the group to feel confident and empowered to embrace their unique self. Brenda is a gifted presenter and has a true passion to teach and share her knowledge and wisdom with others. I would highly recommend Brenda as a motivational presenter. Feng Shui brings positive energy (Chi) into all areas of life, from family and relationships to money and career – experience flow, balance, harmony and abundance! The positive benefits of Feng Shui encourage harmony and happiness in relationships, increased prosperity and fame, and dissolve chronic patterns of failure, difficulty and stress. Brenda artfully combines her intuitive awareness with ancient Feng Shui concepts and principles. With her insightful knowledge, Brenda transforms environments into a personal paradise to create peace, harmony, health, abundance, and good fortune.